Hands-on habitat restoration activities are a great opportunity for the public to be involved in a meaningful way here at the Bay without making any long-term volunteer commitment. Service learning hours are available and groups are welcome. During the rainy season, native plants are planted. At other times of the year the activities are more maintenance oriented, and include removal of non-native plants and temporary watering of the new natives. Participants are also taught why these activities are so important to the long-term protection of the Bay. Service learning hours are available for students. All restoration activities are planned by Newport Bay Conservancy, Project Grow, Orange County Parks or City of Newport Beach, with the support of NBC Volunteers. Newport Bay Conservancy received funding from US Fish & Wildlife Service for a 5-year project to eliminate invasive Algerian Sea Lavender (ASL) from the Bay. Volunteer groups go out to remove the plant either by hand pulling or covering dense areas with black plastic sheeting on Wednesday mornings and the first Saturday of every month. For information or to reserve your place, please contact Newport Bay Conservancy, at (949) 923-2269 or amanda.swanson@newportbay.org. Newport Bay Conservancy received funding from US Fish & Wildlife Service, Southern California Wetlands Recovery Project and R.E.I to restore some of the upper and lower part of the Bayview area of the UNB. Restoration takes place on selected Friday mornings each month. 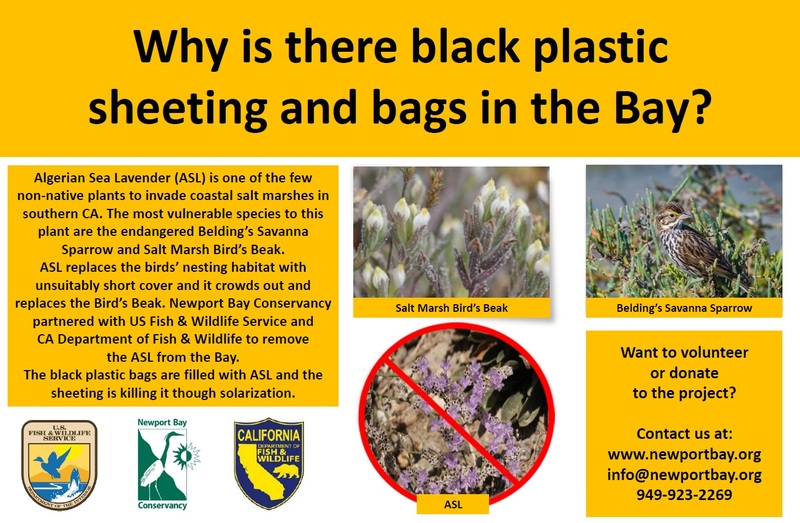 For information or to reserve your place, please contact Newport Bay Conservancy, at (949) 923-2269 or info@newportbay.org. For those under 18, this must be signed by a parent or guardian. To help us, please download, complete and sign the OC Parks Waiver. Hosted by Project Grow, the public can participate in restoration activities on selected Saturdays (ROOTS in Newport Valley) or Wednesdays (Steward Days in the Native Plant Nursery at the Back Bay Science Center) mornings. Under 14 must be accompanied by an adult. For information or to reserve your place, please contact Matt Yurko, Coordinator, at (949) 640-0286 or myurko@projectgrowca.org. A signed waiver is needed for each participant. For those under 18, this must be signed by a parent or guardian. 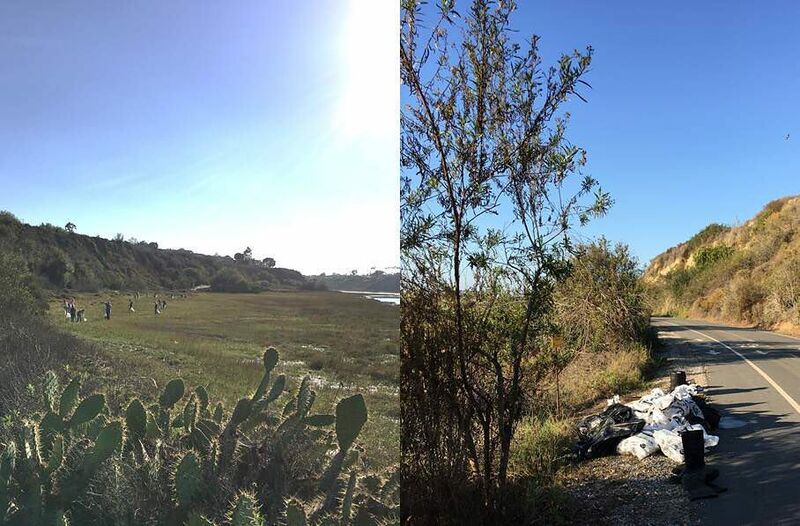 Join Orange County Parks Staff at the Peter and Mary Muth Interpretive Center to enhance the Nature Preserve habitat with non-native plant removal and native plantings on the second Sunday of each month. All ages are welcome. Under 16 must be accompanied by an adult. These take place typically on the 2nd Sunday of the month, from 9:00 AM to noon. To reserve your place, visit letsgooutside.org. For more information you can also contact OC Parks at 949-923-2295 or unbic@ocparks.com. A signed waiver is needed for each participant. For those under 18, this must be signed by a parent or guardian. To help us, please download, complete and sign the OC Parks Waiver. Between September and February when the bird breeding season is over we organize many mini trash cleanup events both from kayaks and from land in partnership with various local organizations. Bring yourself, some friends/family, and help us clean the Bay, especially after major rain events. For these events, everything is provided but make sure to wear close-toed shoes (long, rubber boot are great) and pants that you don’t mind getting a little muddy. These events can be found on eventbrite. Visit, Let’sGoOutside.org and search “stewardship” or “trail work” to look for other restoration events throughout the county that an individual or group may participate.